It took a lot of courage to get into Homs; Sky News, then the BBC, then a few brave men and women who went to tell the world of the city’s anguish and, in at least two cases, suffered themselves. I could only reflect this week, however, how well we got to know the name of the indomitable and wounded British photographer Paul Conroy, and yet how little we know about the 13 Syrian volunteers who were apparently killed by snipers and shellfire while rescuing him. No fault of Conroy, of course. But I wonder if we know the names of these martyrs – or whether we intend to discover their names? There’s something faintly colonialist about all this. We have grown so used to the devil-may-care heroics of the movie version of “war” correspondents that they somehow become more important than the people about whom they report. Hemingway supposedly liberated Paris – or at least Harry’s Bar – but does a single reader remember the name of any Frenchman who died liberating Paris? I do recall my dauntless television colleague, Terry Lloyd, who was killed by the Americans in Iraq in 2003 – but who can remember the name of one of the quarter or half a million Iraqis killed as a result of the invasion (apart, of course, from Saddam Hussein)? The Al Jazeera correspondent in Baghdad was killed in Baghdad by an American airstrike the same year. But hands up who remembers his name? Answer: Tareq Ayoub. He was a Palestinian. I was with him the day before he died. The flak jacket has now become the symbol of almost every television reporter at war. I’ve nothing against flak jackets. I wore one in Bosnia. But I’ve been increasingly discomfited by all these reporters in their blue space-suits, standing among and interviewing the victims of war, who have no such protection. I know that insurers insist correspondents and crews wear this stuff. But on the streets, a different impression emerges: that the lives of Western reporters are somehow more precious, more deserving, more inherently valuable than those of the “foreign” civilians who suffer around them. Several years ago, during a Beirut gun battle, I was asked to put on a flak jacket for a television interview by a journalist wearing one of these 12lb steel wrap-arounds. I declined. So no interview. A similar and equally uncomfortable phenomenon appeared 15 years ago. How did reporters “cope” with war? Should they receive “counselling” for their terrible experiences? Should they seek “closure”? The Press Gazette called me up for a comment. I declined the offer. The subsequent article went on and on about the traumas suffered by journalists – and then suggested that those who declined psychological “help” were alcoholics. It was either psycho-babble or the gin bottle. The terrible truth, of course, is that journos – and for God’s sake, we must stop demeaning our profession by calling ourselves “hacks” – can fly home if the going gets too tough, business class with a glass of bubbly in their hands. The poor, flak-jacketless people they leave behind – with pariah passports, no foreign visas, desperately trying to stop the blood splashing on to their vulnerable families – are the ones who need “help”. The romanticism associated with “war” reporters was all too evident in the prelude to the 1991 Gulf War. All kinds of foreign journalists turned up in Saudi Arabia in military costumes. One, an American, even had camouflaged boots with leaves painted on them – even though a glance at a real desert suggests an absence of trees. Oddly, I found that out in the loneliness of that real desert, many soldiers of the genuine variety, especially American Marines, were writing diaries of their experiences, even offering them to me for publication. The reporters, it seems, wanted to be soldiers. The soldiers wanted to be reporters. This curious symbiosis is all too evident when “war” reporters talk of their “combat experience”. Three years ago, at an American university, I had the pleasure of listening to three wounded US Iraqi/Afghan war veterans putting down a journalist who used this awful phrase. “Excuse me, Sir,” one of them said politely. “You have not had ‘combat experience’. You have had “combat exposure”. That is not the same thing.” The veteran understood the power of quiet contempt. He had no legs. We’ve all fallen victim to the “I watched in horror”/”screaming rockets”/”I was pinned down by shellfire/machine-gun fire/sniper fire” reporting. I suspect I used this back in Northern Ireland in the early 1970s. I certainly did in southern Lebanon in the late Seventies. I am ashamed. While we do bear “personal witness” to wars – a phrase I am also deeply uncomfortable with – this kind of Boy’s Own Paper stuff is a sign of self-regard. James Cameron caught this best in the Korean War. About to land with US forces at Inchon, he noticed “in the middle of it all, if such a thing be faintly conceivable, a wandering boat marked in great letters, ‘PRESS’, full of agitated and contending correspondents, all of us trying to give an impression of determination to land in Wave One, while seeking desperately to contrive some reputable method of being found in Wave 50”. And who can forget the words of the Israeli journalist Amira Haas – Haaretz’s reporter in the occupied West Bank, whom I often quote. She told me in Jerusalem that the foreign correspondent’s job was not to be “the first witness to history” (my own pitiful definition), but to “monitor the centres of power”, especially when they are going to war, and especially when they intend to do so on a bedrock of lies. Yes, all honour to those who reported from Homs. But here’s a thought: when the Israelis unleashed their cruel bombardment of Gaza in 2008, they banned all reporters from the war, just as the Syrians tried to do in Homs. And the Israelis were much more successful in preventing us Westerners from seeing the subsequent bloodbath. Hamas forces and the “Free Syria Army” in Homs actually have a lot in common – both were increasingly Islamist, both faced infinitely superior firepower, both lost the battle – but it was left to Palestinian reporters to cover their own people’s suffering. They did a fine job. Funny, though, that the newsrooms of London and Washington didn’t have quite the same enthusiasm to get their folk into Gaza as they did to get them into Homs. Just a thought. A very unhappy one. 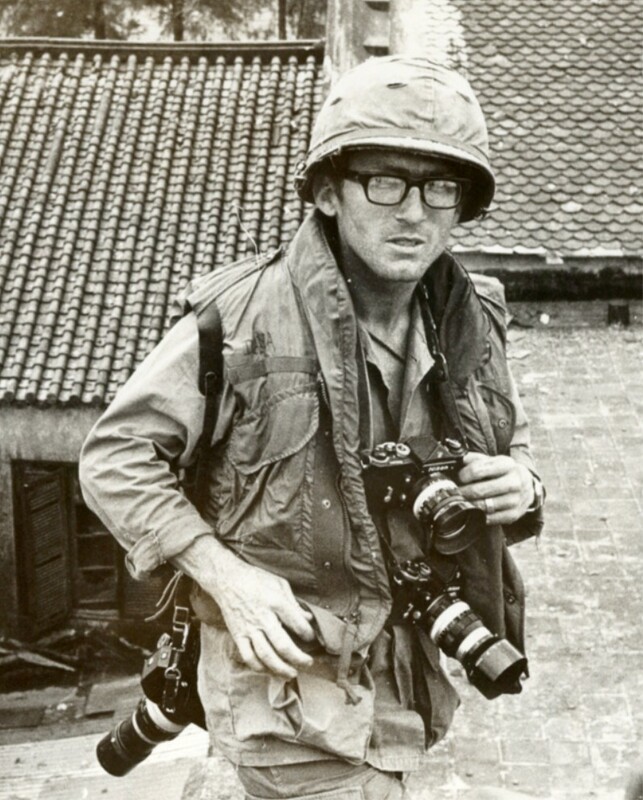 Although he did not report it – Dana Stone the photographer was killed in Vietnam in 1971. There are many of the living who have had burned into their brains forever the unnatural sight of cold dead men scattered over the hillsides and in the ditches along the high rows of hedge throughout the world. Dead men by mass production — in one country after another — month after month and year after year. Dead men in winter and dead men in summer. Dead men in such familiar promiscuity that they become monotonous. Dead men in such monstrous infinity that you come almost to hate them. These are the things that you at home need not even try to understand. To you at home they are columns of figures, or he is a near one who went away and just didn’t come back. You didn’t see him lying so grotesque and pasty beside the gravel road in France.